Vinpocetine is derived from vincamine, an extract of the periwinkle plant (vinca major). Vinpocetine may improve the brain's utilization of oxygen and glucose. The use of vinpocetine to reduce anxiety and improve memory has not been studied in horses, though Vinpocetine is included in many anti-anxiety and calming horse supplements. 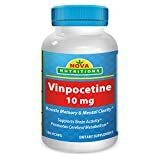 Vinpocetine supplements are available as tablets and capsules.